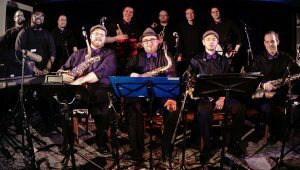 Only active since March, 2017, Ed Lister’s Prime Rib Big Band is a powerhouse, comprised of the best players Ottawa has to offer. The band is made up of 2 trumpets, 2 trombones, 4 saxophones and a 3-piece rhythm section. All the music is Ed’s original material. Along with a couple of reinterpretations, it draws influence from such big band greats as Duke Ellington, Count Basie and the modern jazz harmony edge of Thelonious Monk. Once a month, they perform at Irene's Pub, playing original music showcasing the stylings of Monk, Ellington, New Orleans and more.